During the last two decades many groups have attempted to summarize the current knowledge on diet and cancer and to present the conclusions in the form of sets of guidelines. These have been reviewed here in the symposium. 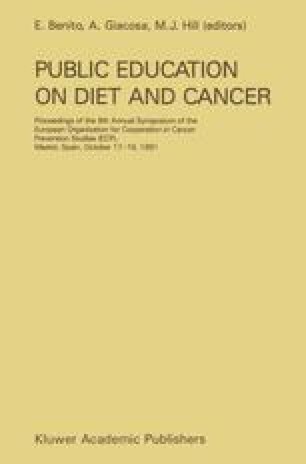 For example, in 1985 ECP and IUNS organized a joint workshop on diet and cancer which produced just such a set of guidelines. Since then much has happened in the field of diet and cancer and so it was decided that it would be timely to update those guidelines. Here we present the conclusions from the workshop held in parallel with the symposium (as described in the Foreword).